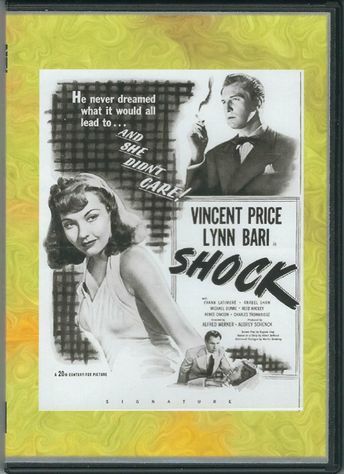 A psychiatrist, Dr. Cross (Vincent Price), is treating a young woman, Janet Stewart (Anabel Shaw), who is in a coma-state, brought on when she heard loud arguing, went to her window and saw a man strike his wife with a candlestick and kill her. Lynn Bari is Dr. Cross's nurse/lover, Elaine Jordan. As Stewart comes out of her shock, she recognizes Dr. Cross as the killer. He then takes her to his sanitarium and at Elaine's urging, gives Janet an overdose of insulin under the pretense of administering insulin shock therapy. He can't bring himself to murder her in cold blood, though, and asks Elaine to get the medicine to save her. Elaine refuses, they argue, and he strangles her. A colleague of Dr. Cross, Dr. Harvey, saves Janet's life and Dr. Cross is taken into custody by a lawyer from the District Attorney's office. This product is NOT a commercially released DVD, it is manufactured on demand using DVD-R recordable media (burned). If your DVD drive or player was made prior to 2001, it may not support DVD-R discs. If disc does not play in your disc player try playing it on your computer. If it plays OK then your player is not compatible with DVD-R discs. Free shipping with tracking only within the U.S. Please allow up to 7 days for production and shipping as this item is made on demand not ahead of time.